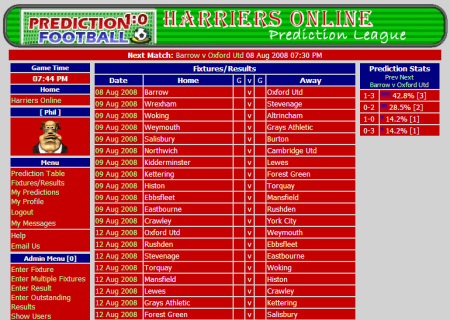 The Harriers Online website have some great news for those of you that like to predict the outcome of matches. In time for the start of the new season we have just launched a new prediction league for all of the Blue Square Premier games. All you need do is sign up - at no cost to yourself. Registration is instant and takes you straight to a page where you can start predicting games. There's no need to do the whole lot in one go just as long as you have entered your prediction by the time each set of games kick off. Once the games have been played the League will be up-dated with the results as soon as possible (things like match reports will have to come first). You can keep an eye on what other users are predicting just by clicking on each individual game and by the time the end of the season comes around you may be top of the League - just like our beloved KHFC then. There are no prizes for the eventual winner but you will get the prestige of being Top Dog Predictor. So what are you waiting for? Get yourself along to the Harriers Online Prediction Leagueand get predicting.